The Amargosa Valley solar energy zone (SEZ) is located in Nevada in the Amargosa Desert in a semiarid basin on undeveloped scrubland. The SEZ is located on BLM-administered land within the Southern Nevada District. In the Draft Solar PEIS the proposed Amargosa Valley SEZ had a total area of 31,625 acres (128 km2). 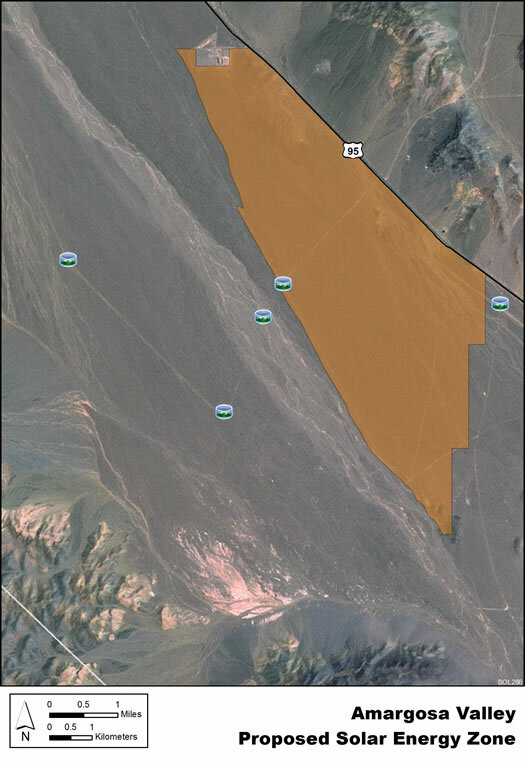 In the Supplement to the Draft, 21,888 acres (88.6 km2) south and west of the Amargosa River floodplain and the area northeast of U.S. 95 were eliminated. Excluding these areas will mitigate many potential impacts, including impacts on Death Valley National Park and desert tortoise. In addition, 1,258 acres (5.1 km2) of Amargosa River floodplain within the SEZ boundaries have been identified as non-development areas. The remaining developable area within the SEZ is 8,479 acres (34.3 km2). No additional changes to the SEZ developable areas were made in the Final Solar PEIS. The Amargosa Valley SEZ is located in southern Nevada in Nye County near the California border. The SEZ is located in the Amargosa Desert, which lies in a valley between Funeral Mountains to the southwest and Yucca Mountain to the northeast. In 2008, the county population of Nye was 44,175, while adjacent Clark County to the southeast had a population of 1,879,093. The closest towns are Beatty, about 11 mi (18 km) north, and Amargosa Valley, about 12 mi (19 km) southeast. Land within the SEZ is undeveloped scrubland characteristic of a semiarid basin. Vegetation within the SEZ is predominantly creosotebush, white bursage, and other low shrubs. The Amargosa River, an ephemeral river, drains the valley and passes across the SEZ from northwest to southeast. U.S. 95 runs along the northeast boundary of the revised SEZ. Dirt roads are present within the interior of the SEZ, and some areas have severe tracking from off-highway vehicle use. The mountain slopes and peaks surrounding the SEZ are visually pristine. The lack of cultural disturbances, the general remoteness of the area, lack of humidity, and the exceptional air quality contribute to unusually dark night skies in the Amargosa Valley and nearby Death Valley National Park. Access to the Amargosa Valley SEZ is via U.S. 95. A 138-kV transmission line runs along the northeast side of U.S. 95 and along the northeast border of the SEZ. As of May 2012, there were no pending solar applications within the SEZ.